Auntie M's Abigail's Baby Sweater has a new home! Auntie M designed some amazing patterns, but for years they’ve only been available via the wayback machine. 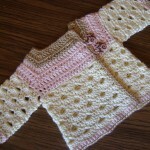 Now her pattern for Abigail’s Sweater has a new home! 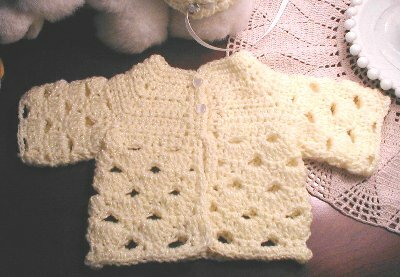 Recently, I was able to contact “Auntie M” via email, and she generously agreed to allow me to republish her pattern for Abigail’s Baby Sweater! I have altered the formatting a little bit as the original formatting was lost in the transfer, but the wording and all instructions remain the same. Auntie M, aka Marsha, retains all rights to this pattern, including copyright. Please do not republish this pattern without her permission, and do not offer it for sale. Thank you, and many thanks to Auntie M! Note from moogly: Many who have made this sweater have found that the end result is very small. Unless you have a very loose natural gauge, consider bumping up to a worsted weight yarn and an H hook for a full term newborn’s sweater. Row 2: 1 hdc in next 5 sts, 3 hdc in next st (corner made). 1 hdc in next 6 sts, 3 hdc in next st (corner made). 1 hdc in next 10 sts, 3 hdc in next st (corner made). 1 hdc in next 6 sts, 3 hdc in next st (corner made). 1 hdc in next 6 sts to end. Ch 2, turn. Row 3: 1 hdc in next 6 sts, 3 hdc in next st (corner made). 1 hdc in next 8 sts, 3 hdc in next st (corner made). 1 hdc in next 12 sts, 3 hdc in next st (corner made). 1 hdc in next 8 sts, 3 hdc in next st (corner made). 1 hdc in next 7 sts to end. Ch 2, turn. Row 4: 1 hdc in next 7 sts, 3 hdc in next st (corner made). 1 hdc in next 10 sts, 3 hdc in next st (corner made). 1 hdc in next 14 sts, 3 hdc in next st (corner made). 1 hdc in next 10 sts, 3 hdc in next st (corner made). 1 hdc in next 8 sts to end. Ch 2, turn. Row 7: Hdc in each hdc and ch across. Row 8: Ch 1, sc in 1st 2 sc. * Ch 3, skip 2 sc, sc in next 3 stitches. * Repeat from * to. Ch 3, skip 3 sc, 2sc in last two stitches Ch 1 turn. Row 11: Ch 3 (counts as dc) 2 dc in 1st ch 1 space. *Skip 1 sc, sc in next sc, skip last sc, 5 dc in next ch 3 space* Repeat from * to end. Skip 1 sc, sc in next sc skip last sc, 2 dc in last space and 1 dc in in 2nd chain at end of previous row. (9 shells and 2 half shells) Turn. Row 12: Ch 1. 1 sc in first 2 dc. * Ch 3. Skip next dc, next sc and next dc (next three spaces). Sc in next three dc. * Repeat from * to * end. Ch 3, skip next three stitches and 1 sc in each of last two stitches. Turn. Row 17. Ch 1 turn. Sc in each stitch across. Do not fasten off. Working up front to first stitch in neck sc in each sc and hdc, 2 sc in each dc on front. 3 sc in first neck stitch (now known as ch 3 group in neck edge.) Sc in each stitch around neck ending with three sc in last neck stitch. Working down opposite front, sc in each sc and hdc, 2 sc in each double crochet. Sl to join with first sc on bottom edge. Fasten off. With right side facing, join with sc in 1st sc made in first row of bodice. Sc in next two sc. Ch 2 skip next sc. Sc in next three sc. Ch 2, skip next sc. 3 sc in center of ch 3 group in neck edge. Sc around neck to opposite ch 3 group of neck edge. 3 sc in center of ch 3 group. Sc in next 8 stitches and fasten off. Round 1: With right side facing. Join with sl stitch in any middle stitch at bottom of armhole. Ch1, sc in same stitch as join and in next stitch. Ch 3, skip two stitches, sc in next three stitches around. At end you will skip last three stitches and join to beginning sc. Round 2: Ch 1, Sc in same stitch. Skip next sc. 5 dc in ch 3 space, sc in middle stitch of next 3 sc group around. Join with sl st in first sc. Round 3: Ch 3. *Skip next sc and next dc. Sc in next three dc, skip next dc. * Repeat around to last Dc group. Skip last dc, ch 1, join with sl st in second ch of beginning ch 3. Round 4: Ch 3, 3 dc in next ch space. 5 dc in ch 3 space, sc in middle stitch of next ch 3 group around to end. 1DC in last ch 1 sp. Sl st to join in top of beginning ch 3. Round 5: Ch 1, sc in same stitch and next 2 dc. Ch 3, *skip to middle 3 dc of next group, sc in each of middle three dc, ch 3* repeat from * to *. Sl st to join in first sc. Rounds 6 to 9: Repeat 2 through 5. Fasten off. Lauren, I’d say it’s around 3 months or so. The Ch 2 counts as a stitch in this pattern. Lauren, it’s not my pattern, and I haven’t ever made it straight through. In general, I find going up a couple of hook sizes and adding a few rows to the length is often enough to take a sweater to 18mths. A J-hook ought to do it! I’m gonna try it first in sport wt. I have a bunch of variegated Bernat baby sport and some Michael’s brand baby sport. I should be able to crank this out pretty quickly, even tho the baby is not due till january! Oh yeah, it’s a super fast pattern! I finally finished the stuff I was working on and made this sweater. I used a size 3 yarn (Joann’s Sensations Cuddle Muffin) and a G hook. My sweater came out about 6″ long from neck to hem and about 12″ around the chest. I suspect that this yarn is not large enough to make a sweater larger than preemie sized. I’m gonna try worsted wt next. Is there a way for me to post a photo in my comment? Hi Sande! Thanks for the info on sizing – sounds like a size 4 or worsted might be better for newborn. Unfortunately there’s I don’t think there’s a way to post photos in comments, but you are welcome to head over to the moogly facebook page and post a photo on the wall! 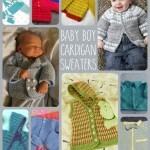 I am thinking of trying to make this sweater for my first grandchild (a little boy) due the end of March. Can you give a rough idea of how many ounces I will need to buy for this sweater??? Thank you. Hi Carol! 200yds or about 3-4 oz would probably do it. However many have found that as written this makes a VERY small sweater. For a full term newborn you may want to bump up to an H hook and a worsted weight yarn. How do I print pattern only & not all the comments? I’m having trouble with the sleeves. After 3 attempts, I keep coming up with 5 shells instead of 6…any suggestions??? Ashley, are you making the Abigail Sweater as above, or the Mini Moogly Sweater? The Abigail Sweater doesn’t indicate a number of shells as far as I can tell. Hi Joan! It’s not my pattern, I’m just re-hosting it for a site that no longer exists, but if I make the pattern I’ll try to add some photos! I adore this little sweater and being quite new at crocheting, I was intimidated by the pattern. I was pleasently surprised, as I took my time to see it come to life and I was so excited! UNTIL I got to the sleeves. I am completely and utterly lost on how to do them. I am very confused by the pattern directions but found the rest of the sweater to be very easy to follow. To start, I was able to “join with a sl stich in any middle stitch at the bottom of the arm hole, sc in the same stitch as join and in the next stitch – ch 3, skip two stitches, sc in the NEXT THREE STITCHES AROUND??? I know it doesn’t mean to sc all the way around, as there is a pattern as it appears on the picture; the same as in the body of the sweater. I am LOST!! Can you help me???? Ch1, sc in same stitch as join and in next stitch. *Ch 3, skip two stitches, sc in next three stitches. Repeat from * until there are 3 sts left. Skip last three stitches and join to beginning sc. In round 3 of the arms; is there suppose to be chains? Hi Clarice! It looks like maybe the asterisk should be before the ch 3, so that you’d ch 3 in every repeat. in round 3 of the arms; do you add any chains; besides the first one? Hi im a beginner crocheter. To work 3 hdc into one stitch, just work the first one in the next stitch as you normally would, then instead of moving to the next stitch from the previous row to make the next st, make your next 2 hdc sts in that same st as you used before. This is an increase – adding more stitches to a row. I hope this helps! I am kind of having a moment…I am on the shell part of this sweater rite after the arm holes. It says by the time you are done with that row, you should have 8 shells…I have a total of 9…am I doing something wrong? I didn’t write this pattern, so if it looks ok I say go with it – it shouldn’t affect the rest of the pattern too much at all – you’ll just have 9 loops and shells instead. Do u use a broomstick hook to make this sweater? No, just a regular crochet hook. 🙂 The bottom is made of shells. I am working on the Auntie M’s Abigail’s Baby Sweater. I did good until I got to Row 7. I am confused a little. I understand the HDC in each HDC but I get a little lost at the ch across part. Can you or someone please explain this to me. 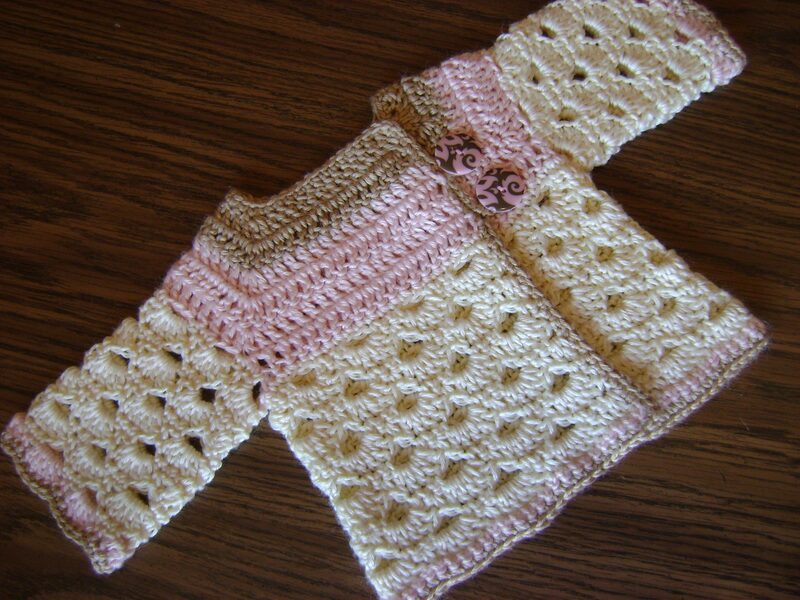 I have never made a sweater and I am making it for my first grand daughter. My daughter is due to have her April 21, 2015. I like to finish the sweater before she is born. Hi Terri! This is one of those “how you read it” things. Perhaps a better way to put it would be “hdc in each stitch, including chains, all the way across the row.” Does that make sense? Yes, it does. I just happened to do that and it looked right so I went with it. If it was wrong I could of redone it. Hi Kathe! The last 9 sts are worked into. The pattern for Row 5 reads : 1 hdc in next 8 sts, 3 hdc in next st (corner made). 1 hdc in next 12 sts, 3 hdc in next st (corner made). 1 hdc in next 16 sts, 3 hdc in next st (corner made). 1 hdc in next 12 sts, 3 hdc in next st (corner made). 1 hdc in next 9 sts to end. Ch 2, turn.